Despite investigations underway, the BJP MP has made it clear that the domestic workers are to blame. 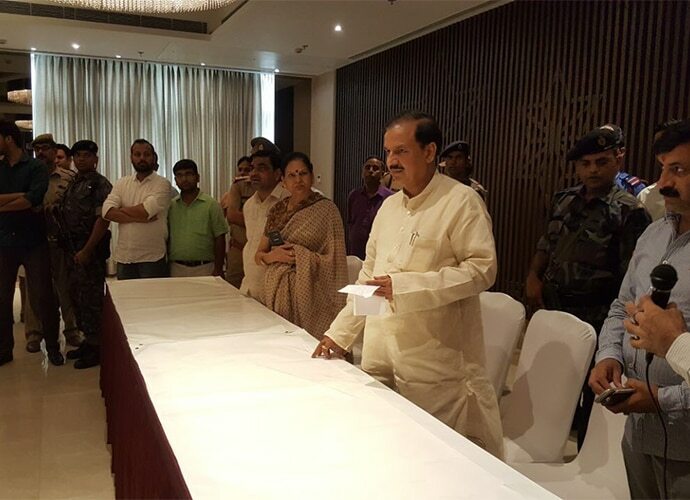 On July 12, Mahagun Moderne, a posh residential society in Noida witnessed rioting. An angry mob from a slum near the neighbourhood, mostly comprising domestic workers, their friends and family, gathered around the society and tried to enter the premises. They also resorted to stone-pelting. What compelled them to riot? A woman domestic worker at one of the houses in Mahagun Moderne had allegedly been beaten up by one of the residents. While the police managed to clean up the mess quickly enough, the matter remained murky, with different accounts reporting different sides to the incident. The employer, Mitul Sethi claimed that the domestic help in question was caught stealing (some reports claim it was Rs 17,000, while others Rs 10,000) from one of the apartments and was soon handed over to police. The protest, according to Sethi, was a response to that. Zohra Bibi, the domestic worker, claimed in her FIR that she was beaten up when she demanded her two-month salary — Rs 12,000. According to the police, on the night of July 11, after Zohra Bibi’s husband reported her missing, the officials conducted a search in the society’s premises, but could not find her. The police claimed that Zohra Bibi was rescued on July 12, in the morning, from a room in the basement of one of the buildings, where she had taken shelter after being physically assaulted by her employer. On the other hand, Zohra Bibi claims she was held captive overnight by her employers at their apartment, not in the basement, after she demanded her salary. Adding to the chaos was a third narrative that claimed that this riot was the mischief of Bangladeshi immigrants. Some even went so far as to label the incident as a communal one instead of a working class rebellion, and even coined the utterly uninnovative hashtag “MaldaInNoida”. “Every individual in the society is scared after Wednesday’s incident. There is no way they can trust the Bangladeshi domestic helps anymore. We will clear their dues and take the help of an agency that provides domestic helps. Children were frightened to see the ugly situation,” Dr Amit Sachdeva, a resident of Mahagun Moderne told Hindustan Times. In fact, the police have so far arrested 13 men, all of whom are relatives of the domestic workers. Despite the fact that an investigation is underway, the BJP MP has conveniently given a clean chit to the Sethi family. But he did not stop there. He also went on to make a veiled (perhaps not that veiled) threat against NGO and human rights activists working for the rights of the domestic workers. With or without Sharma’s help, life has become difficult for domestic workers in the locality. Aside the investigations carried out by the police, the real estate managers at Mahagun Moderne have carried out their own enquiries. A list of 81 workers was released by the society (identified by security guards) naming those who were part of the mob. They have since been blacklisted and refused permission to enter the housing complex. The war against the poor doesn’t end there. 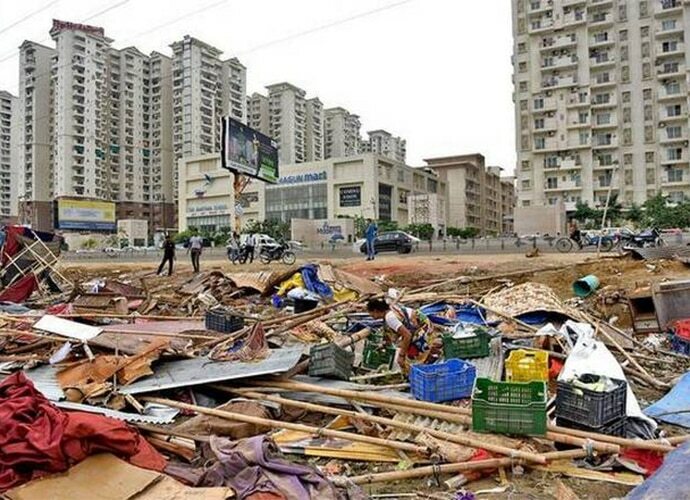 According to a report in The Hindu the Noida Authority on July 17 razed more than three dozen shanties in the area, the slum where most of the supposed agitators lived. The residents of the shanties said that the authorities had not given them prior notice before demolishing their homes. “I have two little children and they are forced to sit in the open in the heavy rain. I cannot shift my family anywhere. If the demolition had been planned, then we should have been given some time. Where will I take my family now?” said Mohammed Javed, a resident of the now demolished slum, to The Hindu. “I had taken out a loan to run a tea stall. They [Noida Authority] also razed my shop. Their action has not only made us homeless, but robbed us of our livelihood,” he added. The Noida Authority officials, meanwhile, said the demolition was part of an anti-encroachment drive. “On the complaints of security due to illegal encroachment, the authority razed the shanties and makeshift shops,” said Noida Authority additional CEO R K Mishra. In India, domestic workers are always on the receiving end of punishment, whether or not they are guilty. Part of a largely unorganised sector, domestic workers have nowhere to go when they are abused by their employers, and in this case the entire establishment. As stated in response to a question tabled in the Upper House of Parliament in 2014, a study was published by the Ministry of Women and Child Development tracking reports of violence against domestic workers between 2010 and 2012. Across India, 3,564 cases of alleged violence against domestic workers were reported in 2012, 3,517 in 2011 and 3,422 in 2010. “Wage, leave facilities, medical benefits, and rest time are at the employer’s mercy. Moreover, they are often victims of suspicion. If anything is missing in the house, they are the first ones to be accused with threats, physical violence, police interrogation, conviction, and even dismissal,” added the report. Mahesh Sharma may have made up his mind about who is right and who is wrong, but it is more than apparent here that even if Zohra Bibi was guilty of theft, as claimed by the Sethis, the price that the workers in the area have had to pay for their "rebellion" is more than unfair. The author is a culture writer who likes talking about the internet, memes, privacy and all things pop culture.